In part one of Rethinking the Future of Business, we examined the state of social media in business. Once again, we take a look at a recent report published by Altimeter Group’s Jeremiah Owyang,”Career Path of the Corporate Social Media Strategist.” As part of a study on social media strategists and the divergent career paths that lie ahead, Owyang reviewed the social framework for socially renowned enterprise businesses as well as corresponding strategies and resources for 2011. The results says more than we may realize at first blush. Most importantly, we’re given a looking glass into the genesis of a next generation business that’s more sociably aware and responsible. Pingback: Rethinking the Future of Business Part 2: Building the Framework | Ramon B. Nuez Jr. This is a very nice read. It is interesting to see how a company can establish itself within a framework. Now I am assuming that a company will move from one framework to another? Would this migration be considered an evolution or devolution? I am assuming it would largely depend on which framework the company wishes to adopt? Hello Ramon, yes. Culture plays a role in the transformation, but what’s clear at the moment, is that a centralized unit for education and governance seems to help the rest of the organization operate as one. Brian we all need to rethink our steps so we can be a better company in the future.. This is the start, but companies have also been trained to hire for “skillsets” and then for the vague concept of “fit”. They need to take the next step of actually figuring out which employees are capable of representing the company and its best interests on an ad-hoc basis. Of course, this is more difficult when companies don’t provide employees with enough information to know what the end goal really is, so either you end up having to 1) train employees to work in such a top-down process-filled environment that they can’t be as agile as the employee, 2) figure out which employees innately make the same decisions that a company would do, or 3) create a business that is open enough to allow capable employees to step up and truly be the face of the company. Its always good to change the strategy every 3 months once or 6 months once, so that we can cope up the market situation and to improve ourselves. The evolution of business will require a social infrastructure — within the org and externally in the ecosystem. 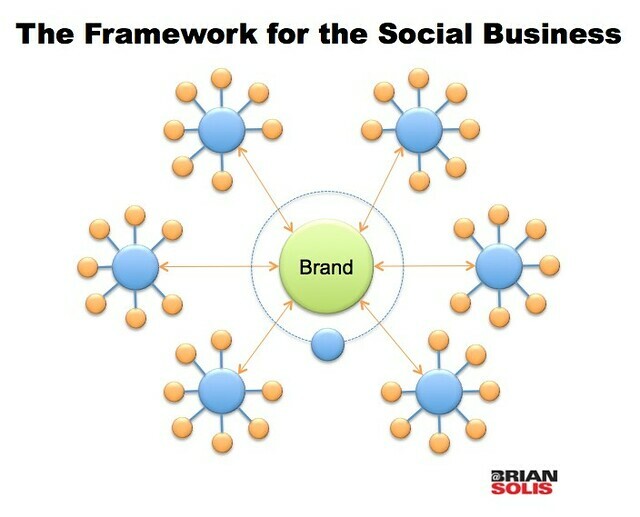 Social software, ROI, a proper framework makes all the difference. Integrating social media into the current architecture of corporations is Gruv Media’s biggest challenge. We spend a lot of time working with executives to create model that they will a). accept and b). has the greatest chance of achieving success. Excellent piece again. These are some of the best pieces on social media and coprporate influence I’ve ever read. Take a bow, Mr. Solis. Love this write-up Brian because I am such a believer that companies now have to look within before they look out. It’s one of the principles Symfonic Marketing has been evolving from over the past few years. I’ve even given it a description of sorts…helping companies align, and shift their marketing communications to deploy customer-centric environments inside, and outside of their organizations. Our site http://www.symfonicmarketing.com clearly defines our version of generosity marketing, and it’s strategy for growth. Thanks for making us smarter Brian, and have a great day! Another masterpiece. I’m not sure which part (1 or 2) I like better. Thanks, Brian! One also has to entertain the possibility that one size will not necessarily fit or be suited to all. Rather corps of various sizes, with differing attitudes to risk and internal culture will adopt their a preferred model or potentially a blend. What you’ve articulated, building on the great work of Jeremiah, is perhaps a viable roadmap to applying a mature social media strategy. Cutting the middle tier is the essence of being social. The article is right on the nose. @Brian: Every (r)evolution starts from the bottom-up. You mentioned that Social Media has not been the catalyst that you envisioned back in 2006. But I think you’ve selling yourself too short here. You’ve provided support and a home base for social media champions around the globe. Yes considering the future of the business the frame building should be done.